Make changes to the structure of your story - add and edit scenes and characters. This is Scratch - the editing interface where you can make changes to your Visual Scroll. To access Scratch, simply tap the "Edit Scroll" button in your Visual Scroll. 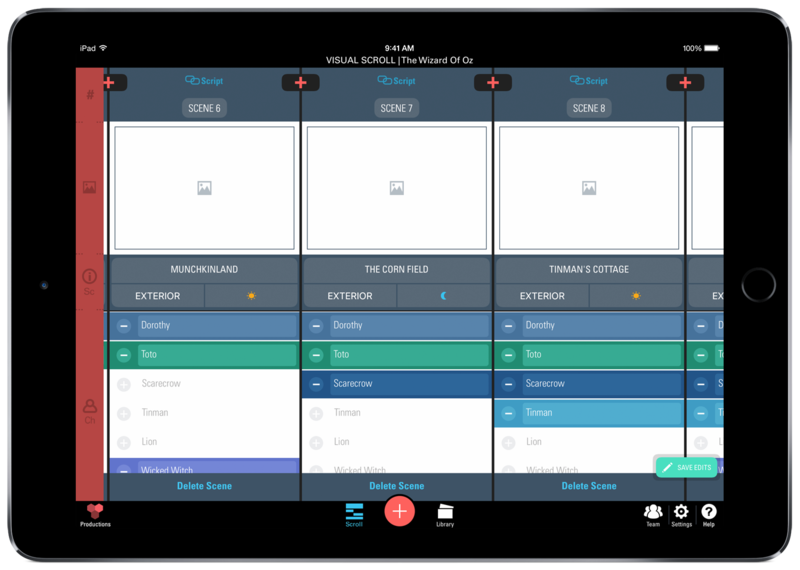 Here, you'll be able to edit Acts, Scenes, and Characters. In this example, we'll be adding a new Scene in between two existing ones. Tap the (+) between Scenes 6 and 7 to add a new Scene. Once you've added the Scene, you may give it a Scene number, Scene title/location, and tag it with the relevant INT./EXT. and time of day. You may want to add a few Characters to this new Scene. Just tap on the (+) button next to the most frequently occurring characters to add the Character, or scroll down and tap "Add Character" to add a new character. Repeat this process with other Character adds. Once you're done with your edits, just tap "Save Edits" and you're back in your Visual Scroll with that new Scene you added! How do I add a new script/document?